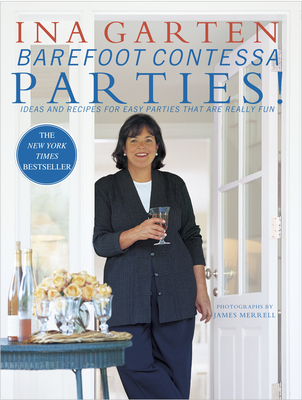 After more than twenty years of running Barefoot Contessa, the acclaimed specialty food store, Ina Garten published her first collection of recipes. The Barefoot Contessa Cookbook was an overnight sensation, but it's the kind of success that can only be grounded in years of experience. In it, Ina shared her ideas for familiar food but with outstanding flavor and -- most important of all -- recipes that really work. Now, with Barefoot Contessa Parties! Ina shares secrets she has gleaned from her years not only as a caterer but as a dedicated party giver. The keyword here is fun. Ina's parties are easy to prepare and fun for everyone, including the host. Forget those boring Saturday-night dinners that just won't end. With Ina's advice, you're certain to have all your friends saying, "Wasn't that fun!" Ina has packed Barefoot Contessa Parties! with plans for pulling off parties like a pro, stories about her own parties, and tips on assembling food (rather than cooking everything) and organizing like a caterer. In the spring you can invite your friends to a party where they all make their own pizzas. Come summer, it's into the garden for a lunch with grilled lamb and pita sandwiches that guests assemble themselves. In the autumn, when it's not Thanksgiving, Ina roasts a fresh turkey, which her friends enjoy with popovers and a creamy spinach gratin. And on a snowy winter's day, everyone is invited for a lunch buffet with seafood chowder and butternut squash and apple soup. Ever since Ina published her first book, people write, e-mail, and stop her on the street to say how much they love the food. She's reached new heights here with recipes like sour cream coffee cake--the ultimate breakfast treat. Salads? The red lettuce, balsamic onions, and blue cheese; Chinese chicken salad; and panzanella may be the best you've ever tasted. Filet of beef is easy to make for a fancy dinner with oh-so-good gorgonzola sauce, or sliced into sandwiches and served with lobster rolls for a Superbowl party. And fans of The Barefoot Contessa Cookbook will be delighted to find the recipe for the Lemon Cake they drooled over but only saw pictured, right here in this book. With so many great ideas and recipes in these pages for you to use, your friends will start to wonder why your parties are always so much fun. INA GARTEN is the author of the bestselling The Barefoot Contessa Cookbook and of the popular monthly column "Entertaining Is Fun" in Martha Stewart Living magazine. For more than twenty years, her Barefoot Contessa specialty food shop has been celebrated for its style as well as its delicious food. Ina lives in East Hampton, New York, and Southport, Connecticut, with her husband, Jeffrey.